Soda blasting can be used for a wide variety of cleaning, stripping and surface preparation processes. Why use baking soda? Sodium bicarbonate is the softest blasting media on the market. It enables the removal of coatings and contaminants without damaging or profiling the substrate. If non-destructive cleaning is critical, then the only abrasive blasting media that should be used is baking soda. Abrasive blasting with baking soda is preferred in many markets where surface preservation is essential. Many industries utilize soda blasting, including remanufacturing, where surface tolerance and specifications cannot change during part cleaning and stripping. It also shines in the contractor segment for removing mold and smoke damage and graffiti removal, as well as industrial cleaning of oils, grease and burnt-on carbon. Manufacturing employs soda blasting for production mold cleaning, and the food and beverage industry uses it for surface cleaning. These are just a few examples. While baking soda is a well-known cleaning agent, there are a few things to note before getting to work. The equipment necessary for soda blasting includes an air supply with adequate cubic foot per minute (CFM) specifications for nozzle size, hose length and desired blast pressure; an after-cooler (depending on air quality); a moisture separator; a blast pot, hose and nozzle; and, of course, ARMEX blast media. While conventional sand blasting systems are usable, they will ultimately compromise performance and increase blast media consumption. Thinking about using a cabinet system for wet or dry soda blasting? Such equipment is usually designed to recycle abrasives, but sodium bicarbonate is extremely friable and is pulverized upon impact at any pressure. Therefore, it cannot be recycled when used in a cabinet. Although cyclone recycling systems capture and clean reusable media and feed it back into the blast stream, pulverized soda will bypass this type of cyclone. 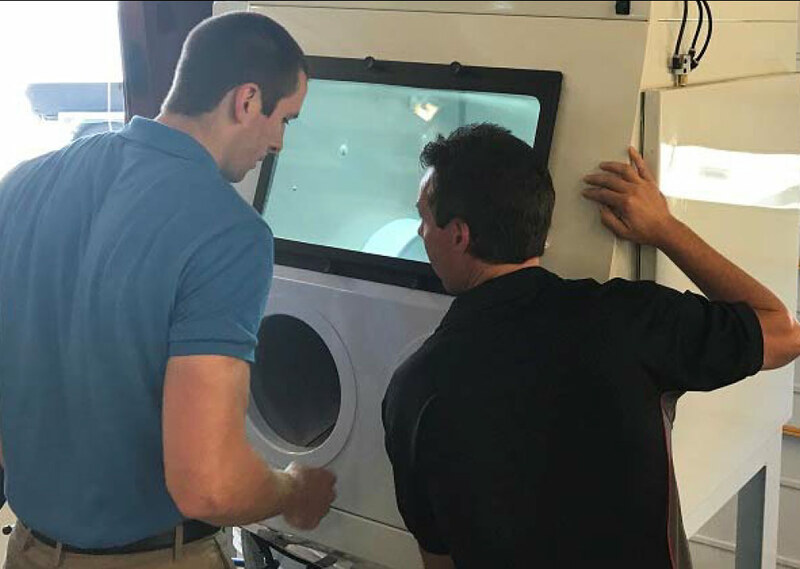 As a result, all the dust and debris will fill the dust collector prematurely, and the dust generated while blasting will greatly reduce visibility in the glove box. On the other hand, cabinets designed for soda blasting maintain good visibility by drawing air across the view glass. This type of system uses a cyclone to drop up to 99 percent of the debris, waste and spent media into a drum or other receptacle. Only the very fine particulate goes to the dust collector, which as a result is preserved for longer use. If drummed waste is non-hazardous, it can be easily hauled away to a sanitary landfill. To achieve optimum results with blast pots, it is highly recommended that equipment manufactured specifically for baking soda blasting be used. Even though conventional systems may be used, performance and economy will be compromised. Pressure systems will generally work better than suction systems. It is imperative that the volume of air available be appropriate for the size of the nozzle and the blast pressure used for operation. ARMEX can be used in a dry, vapor or wet blast pot. Check that the volume of air available is appropriate for the size of the nozzle and the blast pressure. The larger the nozzle, the more air volume is required. However, it’s important not to confuse available volume (CFM) with available pressure (PSI). 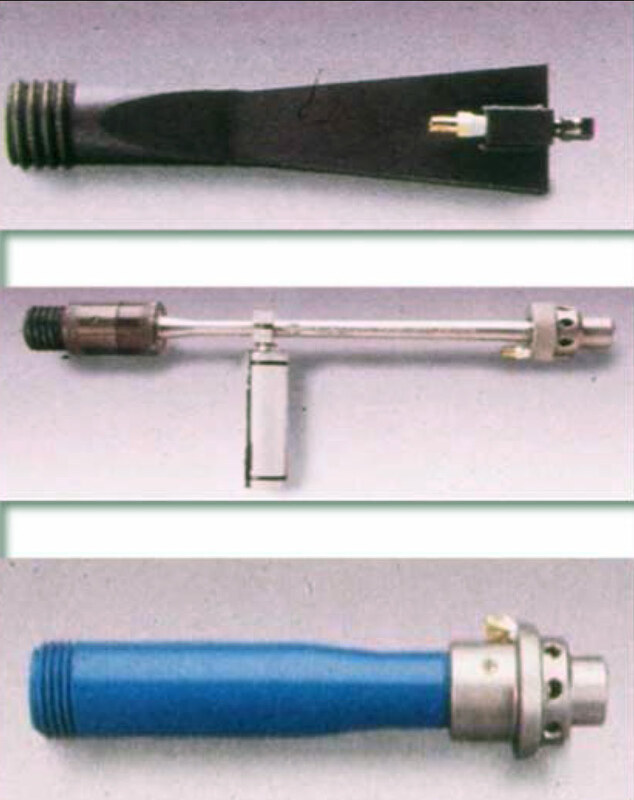 There are three different types of nozzles that can be used with soda blasting: bore, venturi and fan. The size of the nozzle bore impacts volume and pressure, and also affects the size of the blast pattern. For each nozzle size increase, expect up to a 10 percent increase in the size of the blast pattern. But it’s the nozzle’s shape, rather than its orifice size, that has the most impact on the size of the blast pattern. As compressed air enters the converging end of a straight bore nozzle, it speeds up, accelerating the sodium bicarbonate particles and suspending them in the flow. The particles exit the nozzle in a tight stream and produce a concentrated blast pattern upon impact. These types of nozzles are commonly used in blast cabinets and for spot blasting, but are not recommended for blasting large surfaces. These nozzles are designed to produce an effect that greatly accelerates air flow and particles. The angled shape of the diverging end spreads out the flow, producing a large blast pattern and a more uniform particle distribution than can be achieved with a standard bore nozzle. Compared to straight bore nozzles, long venturi nozzles deliver up to 40 percent better production rates and consume less abrasive media. These nozzles provide minimum dust control (as opposed to water induction nozzles, which offer maximum dust control) while stripping delicate substrates during cleaning operations. On large, flat surfaces, a fan blast nozzle can double the pace of surface preparation, since its blast pattern ‘fans’ out to achieve a greater cleaning area. These nozzles are excellent for medium cleaning and stripping applications, where an even dispersion of the abrasive throughout a wide uniform blast pattern is required. It should be noted that pressure can drop significantly between the compressor and the nozzle, up to one PSI per 50 ft. for a one-inch inner diameter hose. Pressure will also decline with each bend in the hose or change of direction. Therefore, it is recommended to select the shortest, straightest hose configuration. It is also important to check for ill-fitting couplings or leaks in the hose, which could result in total pressure drop. The diameter of the hose or fitting will also affect performance. The inner diameter of the hose should be three to four times that of the nozzle orifice. With a ½-in. inner diameter blast hose feeding a ½-in. orifice nozzle, abrasive particles will move through the hose at the same rate as they exit the nozzle. Because baking soda is non-destructive, blast nozzles whether ceramic or steel—will not wear like nozzles using hard blasting media. In air-driven uncontained applications, ARMEX can be used dry or wet. When used wet with a pressurized water or vapor system delivery method, dust will be minimal. When used dry, containment for migrating dust may be required, or other mitigating measures such as negative air chambers or air scrubbers can be used. A water injection nozzle or halo ring that introduces water to the air stream will also reduce dust. First and foremost, always adhere to the manufacturer’s operating instructions for all equipment and follow all set-up and safety instructions. Safety first! A properly fitted dust mask or respirator, safety glasses and/or safety shield are essential, as are gloves, long pants and a long-sleeve shirt to protect exposed skin. Do not aim the nozzle anywhere other than at the substrate being blasted. Before each use, inspect the tank for any signs of corrosion, and make sure the rubber hoses are not dry-rotted, cracked, split or showing any other signs of wear or abrasion from use or storage. Make sure the airline is disconnected, and allow the tank to bleed pressure before opening the fill cap. Always check to make sure that the deadman valve is closed before connecting the blaster to the air supply. Check that the deadman valve is operating properly by depressing the valve lever and releasing; it must close over the nozzle under its own spring pressure. If it does not, do not use the deadman valve until the spring or obstruction is repaired. Grounding is key to reducing the risk of static shock and avoiding efficiency-robbing static buildup throughout the blast system. Always follow equipment manufacturers’ recommendations for grounding. Soda blasting media is highly susceptible to moisture absorption. If using baking soda other than ARMEX, this can cause clumping and erratic operation. (ARMEX products have flow aids and advanced moisture control additives that will prevent blasting equipment from clogging, and help to preserve ARMEX when stored or used in high-moisture environments.) When using other baking soda abrasives, it is imperative to have an effective moisture filter or desiccant system in the air supply immediately before the air inlet. Be sure to drain any moisture captured in the moisture filter before and after each use, as failure to do so may cause ‘caking’ of media and complete blockage of equipment. ARMEX is environmentally friendly, and classified as a non-hazardous and non-toxic (GRAS) material. The blast media used in soda blasting can be formed from several different sizes of sodium bicarbonate crystals, each appropriate for specific types of cleaning applications. ARMEX has developed 11 sodium bicarbonate formulas, with mean particle sizes ranging from 70 microns to 270 microns. Generally speaking, more robust surfaces can withstand higher crystal sizes. 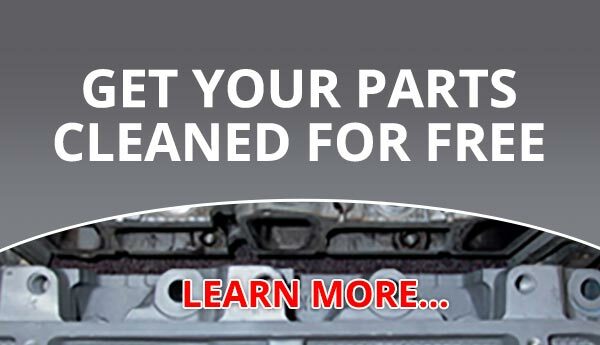 Larger particles yield more cleaning power, making the correspondent formulas appropriate for thicker coating removal and heavier cleaning applications. Medium-sized particles carry less mass but deliver more hits per square inch to the material being cleaned, and thus are suited to remove thinner coatings on more sensitive substrates. Smaller particles are best for substrates that are more delicate; ARMEX uses them to create specialty formulas for very specific surface preparation requirements, such as highly sensitive, thin or composite materials. Soda blasting is a versatile process, from its use in cleaning colossal statues to blasting greasy residue off automotive parts. The ARMEX family of sodium bicarbonate formulas is versatile as well, and excels at removal of grease and oil, coatings, burnt-on carbon, gasket materials, grime and any other contaminant that is softer than baking soda. ARMEX can be used for abrasive blasting on a wide variety of materials, including glass, steel, aluminum, lead, alloys, plastics, rubber, composites, wood, masonry materials and PVC—all without damaging the substrate materials.